Tour possibilities abound in Savannah, Georgia; you can’t walk a Square of the Historic District without passing a tour bus, buggy tour or walking tour. 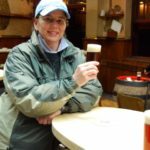 Ghost tours, film tours, history and architectural tours abound, but for foodies, devote a few hours of your visit with a walking food tour. “Famous & Secret East-Side Food Tour,” is one of three tours currently offered by Savannah’s Taste Experiences, run by brothers Stu and Donald Card. On our three hour walking tour, we visit six establishments on the east side of the Historic District, mostly casual and unpresuming, as opposed to some of Savannah’s upscale restaurants. 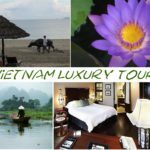 This is a different approach than other tours I’ve experienced, so don’t expect white table cloths and trendy décor—just good local flavor and technique. Our group of seven out-of-towners is an easy-going cadre of obvious foodies from New Jersey, Virginia, and Illinois, with me representing the West Coast, from Oregon. It’s a well-travelled group and one member tells me, “We do food tours wherever we go because they often turn out to be the highlight of the trip.” We chat our way through our tastings, in full agreement that it’s best, if possible, to take a food tour early in your trip so as to get recommendations on where to eat the rest of our visit. Current tour stops include the Pirate’s House, Wall’s BBQ, 17Hundred90 Inn, Fire Street Food, Zunzi’s Takeout, and Savannah Candy Kitchen. 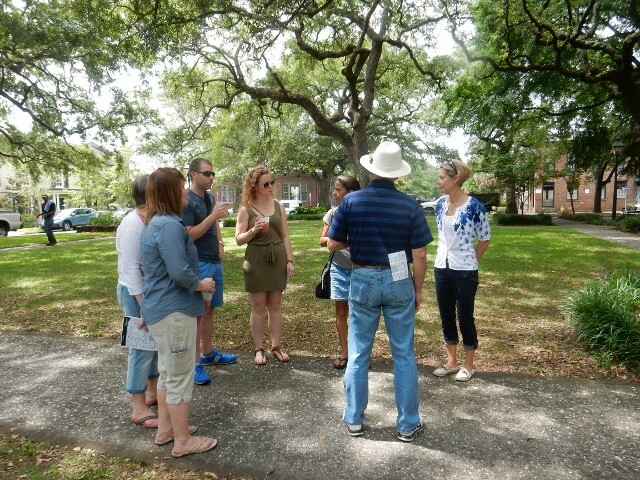 Tour guide Irene Bagley-Heath is affable and funny and throughout the tour; she shares Savannah history and lore (some of it a bit bawdy—this is Savannah, after all), an insider’s friendly restaurant gossip, and positive civic pride that show a real love for her adopted home town. At Pirate’s House, a block from the Savannah River riverfront, we settle into our booth at the back of bar. 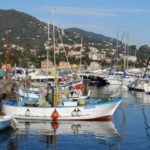 This restaurant has been in business since 1753, and actually was a pirate hangout back in the day. 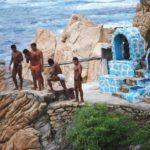 Today, there are more tourists than locals and the kiddie menu, complete with eye patch and pirate hat, and buffet make it a great place for families. 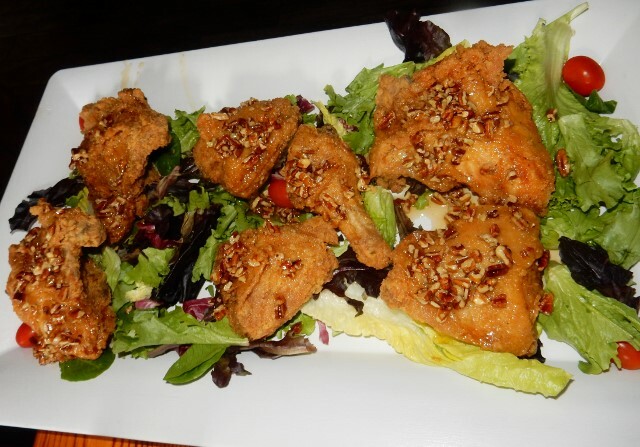 We pass a platter of one of their signature dishes–fried honey-pecan glazed chicken. Moist, sweet, and perfectly fried. Savannah, of course, is an “open-carry” town—you can walk down the street carrying an alcoholic beverage—so a few of my fellow visitors order a cocktail or a sweet tea to go, and plastic cups in hand, we’re off to our next stop. Wall’s BBQ is in a squat, concrete block building on East York Lane, somewhat hidden by oleander and palmetto, and being situated on a Lane almost qualifies it as a hole in the wall in and of itself—“lanes” in the Historic District are closer to alleys than streets and newcomers often have a hard time finding their way around until they figure out the system. While the décor won’t win awards; Glory! the BBQ is delicious. Miss Teresa Weston serves BBQ ribs, pulled pork and chicken, and pork chops, baked turkey wings, fish sandwiches, deviled crab, and all the right sides. Here, we enjoy a 1/2 pulled pork sandwich and spice it up with our choice of Miss Theresa’s three homemade sauces. The desserts are made fresh daily and “when they’re gone, they’re gone and they’re gone early,” so we place dessert orders right away. Eat in, or take your food out to Greene Square to enjoy. 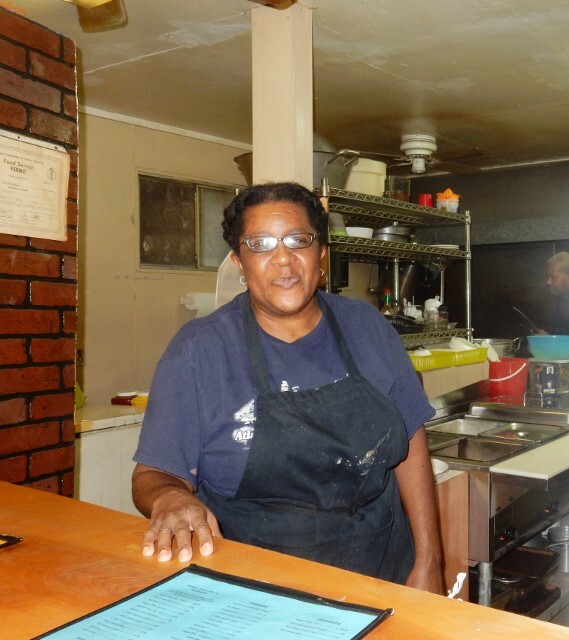 Miss Teresa’s BBQ has been family-owned since 1963. The antebellum brick and architectural details of 17Hundred90 Inn help make this spot a good stop on any visit to Savannah. 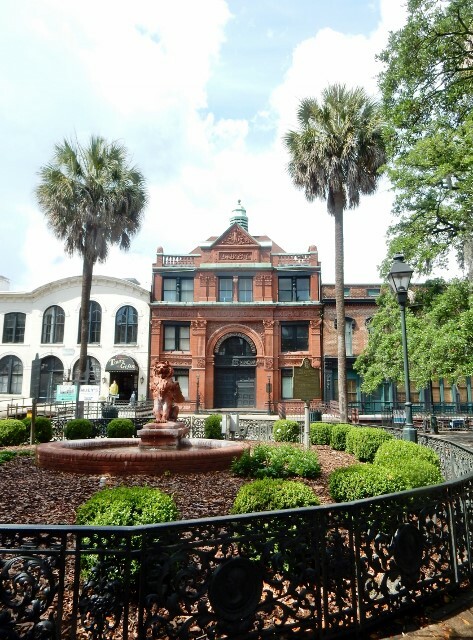 The restaurant and inn is said to be one of the most haunted buildings in all of Savannah; no small distinction in a city that often claims to be the country’s most haunted city. 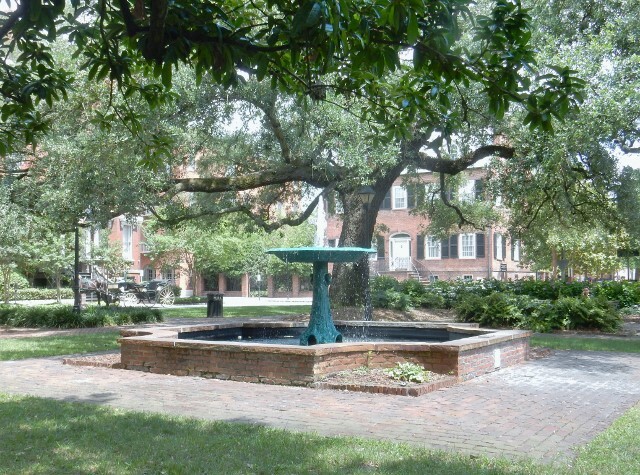 There are at least three ghosts believed to inhabit the inn, and Irene quips, “Guests pay a pretty penny to be haunted here.” Originally a boarding house, 1790 refers not to when the inn was built (that would be sometime between 1821 and 1823), but rather when Savannah was officially formed. 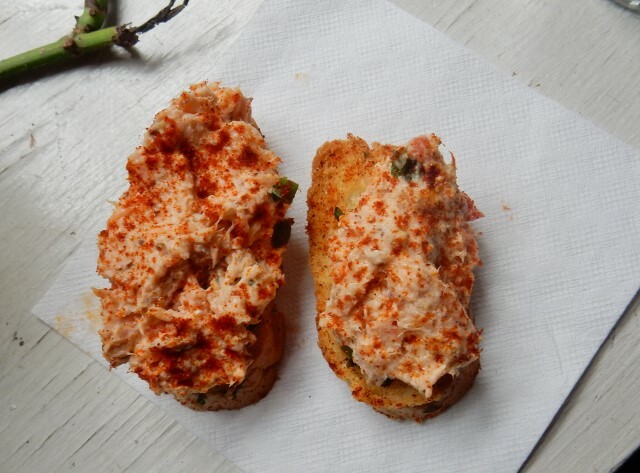 Here, we enjoy salmon crostini, a flavorful Atlantic salmon spread heaped on crunchy toasts. Irene also highly recommends their crab cakes, steaks and hamburgers and mixed cocktails. Savannah truly is one of the most beautiful cities in the South. We walk the streets in full appreciation of the well-kept town houses and mansions, many open to public tours, and many more housing families and businesses. We pass fountains, statues, and gardens. 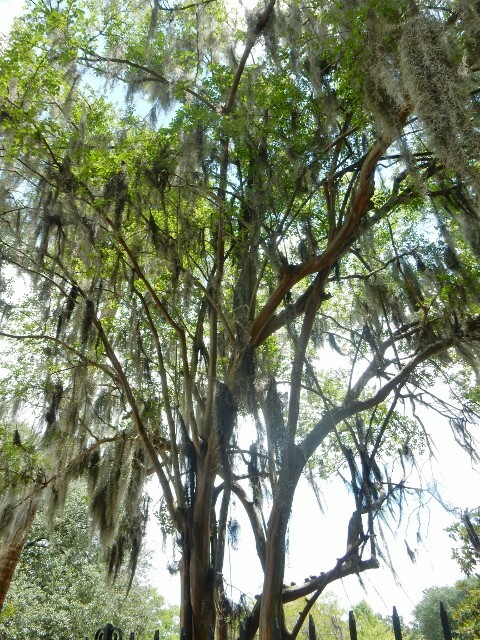 We take in the azaleas, jasmine, magnolias, and live oaks and the Spanish moss hanging from their mighty branches. 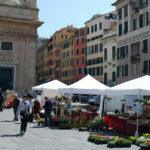 Irene tells us, “Outside of the Historic District, you really can eat from anywhere in the world. We really do have people here from all over, and we don’t only eat Southern. There are especially great places for take-out. 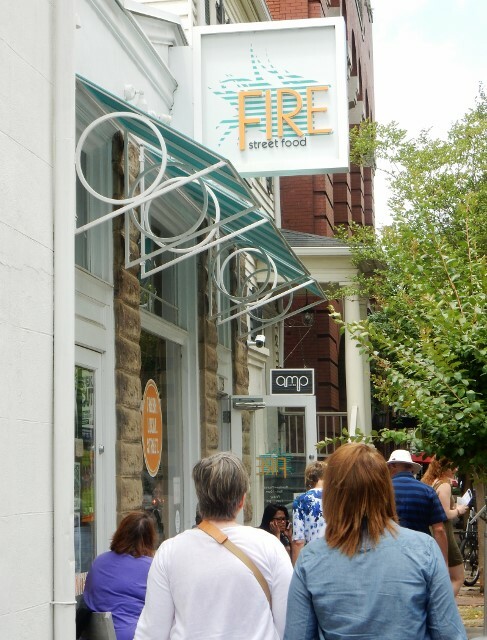 We’ll jump off the Southern bandwagon here at Fire Street Food.” Ele and Sean Tran, originally from Vietnam, own six restaurants in Savannah, all offering Asian-inspired cuisine. 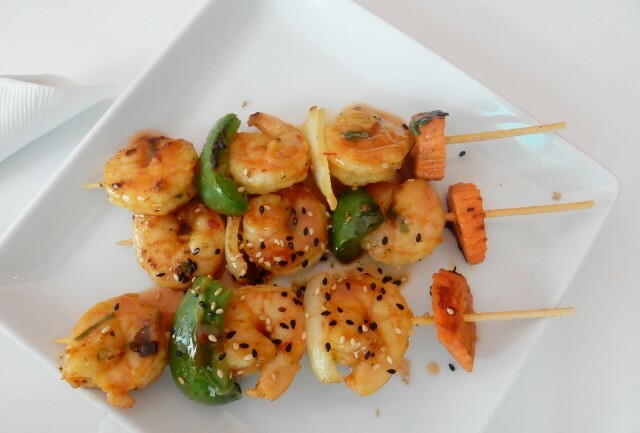 We pass platters of curry shrimp skewers; wonderfully large, fresh and perfectly cooked shrimps skewers with green pepper, onion, and carrot, topped with black sesame seeds. “Light, inexpensive and quick,” Irene says, while we nosh and nod. Besides skewers, you’ll find noodles, sushi, teriyakis and curries on the menu. There are a few tables at an outdoor patio, but Zunzi’s is a place for take-out. 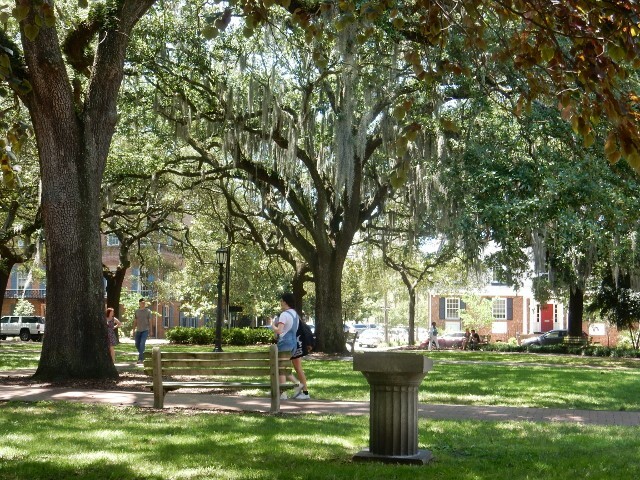 We walk over to beautiful Chippewa Square (one of my favorite—and anyone who visits Savannah quickly chooses their personal favorite Squares) right across the street. 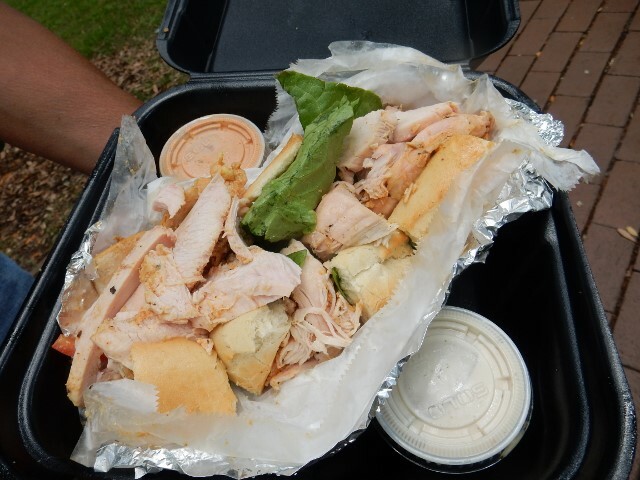 You can’t enjoy one of Zunzi’s Chicken Conquistador sandwiches without a handful of napkins and some finger licking. Moist, flavorful chicken breast is paired with tomatoes and lettuce, and topped with both a Cesar dressing and their “Sh#@t yeah” Secret Sauce.” (Our guess: sriracha and mayo.) Irene also highly recommends their portobello sandwiches, smoked sausage and hummus. We make our way back to the riverfront for our final stop, to Savannah’s Candy Kitchen. Candy making takes center stage, surrounded by one display after another of the many sugar-laden products for sale. There’s saltwater taffy, fudge, truffles and other chocolate confections, and the Pecan Pralines we enjoy for dessert. 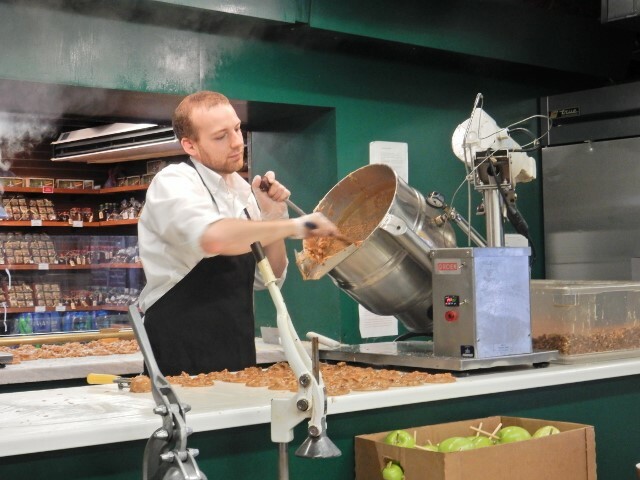 The Pralines are palm-sized, light caramel-colored and pecan-filled. We enjoyed ours hot out of the oven soft; a delicious, sweet ending to the tour. 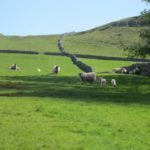 The tour covers about 1.5 miles of easy walking, lasts about 3 hours, and includes only locally-owned restaurants and shops. Your guide map will show your route and also includes coupons good at each of your tour stops. NOTE: Nancy was hosted by Savannah Taste Experience, but the opinions and impressions expressed here are her own. 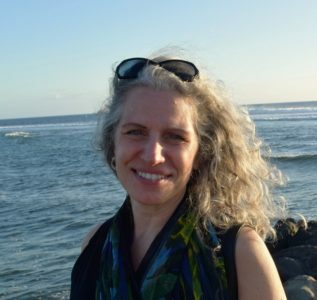 Nancy Zaffaro is a freelance writer and photographer who concentrates on travel, food and beverage, culture and arts and Editor of the digital travel magazine, ConfettiTravelCafe.com. Nancy Zaffaro took her first solo trip at 17 years old and has been hooked on travel ever since. Contact her at nancyz@nancyzaffaro.com.